Copyright: © 2018 Jeremic I, et al. This is an open-access article distributed under the terms of the Creative Commons Attribution License, which permits unrestricted use, distribution, and reproduction in any medium, provided the original author and source are credited. Drug Reaction with Eosinophilia and Systemic Symptoms (DRESS) syndrome is a severe, potentially life-threatening idiosyncratic drug reaction. It is usually caused by antiepileptics, antibiotics or non-steroidal antiinflammatory drugs, after a latency period of three weeks to three months. Typical clinical features include mucocutaneous rash, fever, lymphadenopathy and internal organ involvement. We report a patient with systemic sclerosis, rheumatoid arthritis and osteoporosis who developed possible DRESS syndrome to lamotrigine, used for epilepsy. Clinical features suggesting DRESS syndrome included severe rash, fever, hematological abnormalities and time of appearing and disappearing of skin changes. The condition was initially unsuccessfully treated as an acute allergic reaction to ibandronate, without discontinuation of lamotrigine. This report aims to increase the awareness of this rare entity in the rheumatology community. Drug Reaction with Eosinophilia and Systemic Symptoms (DRESS) syndrome is a severe idiosyncratic drug reaction, characterized by a prolonged latency period, followed by a variety of clinical manifestations, including severe cutaneous eruption, fever, hyper eosinophilia and internal organ involvement, typically liver, hematopoietic system, kidneys, lungs, heart and pancreas. It may be caused by various medications including antiepileptics, antibiotics (antituberculotics, antiretroviral drugs, drugs for viral hepatitis, sulphonamides), non-steroidal anti-inflammatory drugs, and many others. Symptoms and signs of DRESS syndrome usually appear 3 weeks to 3 months after drug introduction. It may be difficult to diagnose DRESS syndrome due to heterogenous clinical presentation. Most used diagnostic criteria are Japanese group criteria for diagnosis of DRESS (SCAR-J) and Register for Severe Cutaneous Adverse Reactions to Drugs criteria (RegiSCAR) (Tables 1 and 2). Mortality is estimated to be 10%-20%. Therefore it is very important to recognize DRESS syndrome as early as possible, stop treatment with causative drug and to start appropriate therapy with systemic steroids [1-3]. Total score: 7=Typical DRESS; 5=Atypical DRESS; <5=consider other diagnosis. Table 1: J-SCAR diagnostic criteria for DRESS. At least 2 of edema, infiltration, purpura or scaling. Final Score: <2 No DRESS; 2-3 Possible DRESS; 4-5 Probable DRESS; >5 Definite DRESS. Table 2: Regi-SCAR-group diagnostic criteria for DRESS. We report a female patient, 55-years-old, diagnosed with overlap syndrome of systemic sclerosis (SSc) and rheumatoid arthritis (RA) since 2015, who also had severe osteoporosis (OP). Patient had diffuse SSc from 1996 with skin, joints and esophageal involvement. She was diagnosed with the SSc and seropositive RA overlaps nineteen years later. Seropositive RA diagnosis was based on erosive, symmetrical polyarthritis, high levels of rheumatoid factor in serum and synovial fluid. The overlap syndrome has been treated with 7.5 to 10 mg/day prednisone. Oral therapy for the severe osteoporosis was contraindicated due to esophageal dismotility; so after esophagogastroduodenoscopy parenteral ibandronate was suggested. She was also substituted with levothyroxine due to thyroid gland hypo function. In February 2015, she was diagnosed with epilepsy after recurrent seizures, electroencephalographic changes without causative CT lesions. Initially she used valproic acid and sodium valproate until February 2016, when started lamotrigine monotherapy. 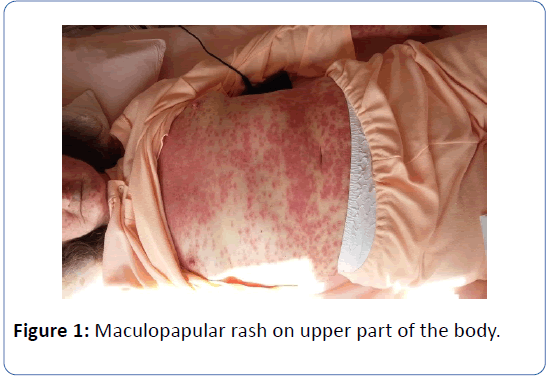 At the beginning of April 2016, one day after first ever intravenous ibandronate, patient had extensive maculopapular rash on face, chest and extremities (Figures 1 and 2). Figure 1: Maculopapular rash on upper part of the body. 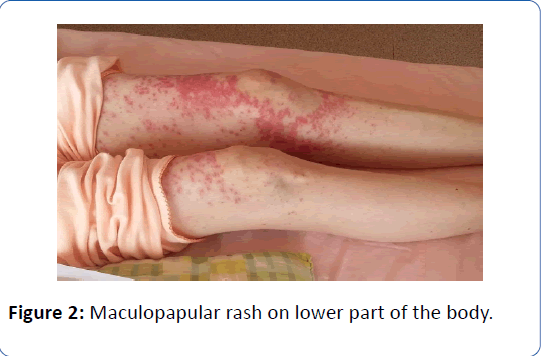 Figure 2: Maculopapular rash on lower part of the body. It was interpreted as acute allergic reaction to ibandronate. She was urgently treated with parenteral antihistamines and glucocorticosteroids for three consecutive days. She was not adviced to stop lamotrigine which she used along with her earlier therapy: Beta-blocker, ACE inhibitor, aspirin, vitamin D and calcium supplementation. Skin changes were not resolving. Therefore the patient was referred to her rheumatologist for further investigations. Based on patient’s history, clinical signs and laboratory results, DRESS syndrome after eight weeks of lamotrigine introduction was suspected. Patient had atypical DRESS syndrome with skin changes, fever (up to 38C), and blood count abnormalities: significant lymphocytopenia (0.3-0.7 × 109/L) and transient mild thrombocytopenia (132-300 × 109/L). Lack of eosinophilia could be explained by previously used glucocorticosteroids, both longtime therapy with up to 10 mg/day prednisone and acutely given high doses for allergy emergency. Immediately lamotrigine was stopped. During next two weeks patient was treated with methyl-prednisolone 60 mg/day, after allergologist and dermatologist consultations. She was on standard therapy with ACE inhibitors as renal crisis prevention with blood pressure monitoring. The initial dose was tapered to 10 mg/day prednisone during next few weeks. Emoliens was applied as local therapy. After three weeks hospitalization she was discharged stable with prednisone tapering dose of 20 mg/day, gastroprotection, cardiovascular therapy and switched anti-epileptic drug to levetiracetam. Allergologist advised both lamotrigine and ibandronate contraindicated in future, further specific late-onset allergy testing had not done yet. In follow-up period she had skin changes resolution after four months of lamotrigine discontinuation. Typical DRESS syndrome is systemic inflammatory involvement of multiple organs caused by delayed allergic reaction to a drug. Since it damages multiple organs, presentation is often dramatic with skin and mucosal rash, laboratory findings of elevated liver enzymes and blood count abnormalities, constitutional symptoms (fever, lymphadenopathy) and clinical presentation of different organs inflammation. In this article we report a patient with atypical presentation of DRESS syndrome. Patient mostly satisfied RegiSCAR criteria for DRESS syndrome (Table 3). DRESS syndrome manifestation (febrility, eosinophilia, lymphadenopathy, organ damage) at patient could have been masked by previous use of glucorticosteroids, re-inforced with the same therapy in high doses for acute allergic reaction. Furthermore eosinophilia is registrated in only 1/3 of cases of DRESS syndrome . There were other blood count abnormalities as lymphopenia and thrombocytopenia which could not be attributed to autoimmune diseases activity or other reasons, which are sometimes observed . Any new organ involvement, except hematopoietic system, was not registered using laboratory, CXR and ultrasound imaging. She had also previous scleroderma skin changes, no active arthritides and wasn't complaining about gastrointestinal disturbances. At least 3 biological investigations done and negative to exclude alternative diagnosis Partially evaluated by laboratory, ultrasound and CXR. Table 3: J-SCAR diagnostic criteria suggested to consider other diagnosis whereas Regi-SCAR criteria were fulfilled for possible DRESS. Our case report highlights how difficult it may be to diagnose and treat DRESS syndrome, a potentially lifethreatening disorder. Criado PR, Avancini J, Santi CG, Medrado AT, Rodrigues CE, et al. (2012) Drug reaction with eosinophilia and systemic symptoms (DRESS): A complex interactions of drugs, viruses and the immune system. Isr Med Assoc J 14: 577-582. Cacoub P, Descamps MP, Meyer O, Speirs C, Finzi L et al. (2011) The DRESS syndrome: A literature review. Am J Med 124: 588-597. Shiohara T, Kano Y, Takahashi R (2009) Current concepts on the diagnosis and pathogenesis of drug-induced hypersensitivity syndrome. JMAJ 52: 347-352. Criado RP, Criado FR, Avancini JM, Santi CG (2012) Drug reaction with eosinophilia and systemic symptoms (DRESS)/drug-induced hypersensitivity syndrome (DIHS): A review of current concepts. An Bras Dermatol 87: 435-449. Choudhary S, McLeod M, Torchia D, Romanelli P (2013) Drug reaction with eosinophilia and systemic symptoms (DRESS) syndrome. J Clin Aesthet Dermatol 6: 31-37.